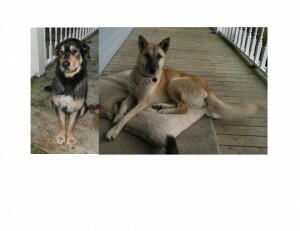 FOUND: Roaming Dogs: Blue Mountain, Pictou Co., NS — Shepherd: Blonde & Rottie: Black/Tan, Male, Adult — "Unknown"
Additional Notes: Shepherd, blonde & Rottie Mix, Black/Tan “Unknown” This two adorable dogs have been found roaming in the Blue Mountain area of Pictou County. They are both sweet and friendly. It looks like they may have been roaming for a while as they are a little thin.